Remember those wonderful gluten-free graham crackers I mentioned the other day? They were so good, so perfectly crisp and just lightly sweet. As if by magic, I just knew what I would do with the rest of them. It was high time I made banana pudding. For those of you that are not from the Southern portion of the United States, banana pudding may not seem like a big deal. But for those of us that are from the South, banana pudding speaks to our hearts. Banana pudding is something your mom, your grandmother, or your aunt always made. (Or in my case, growing up with parents that were not from the South – it was something other people’s grandmother’s and Babe’s Chicken Dinner House made.) Creamy, with those Nabisco Nilla Wafers and bananas, often topped with whipped cream or meringue, this is the comfort dessert. I’ve had countless variations of banana pudding before my gluten-free days, but the ones made with real pudding (not the stuff from a box) were always the best. And yet, for some strange reason, I’d never tried to make it myself. It was time to change all of that. Now, I wonder why it took me so long to make it. Pudding is easy. It takes just a few minutes of standing over a saucepan, stirring, and then into the fridge it goes. The graham crackers were a perfect compliment – with their almost molasses-y flavor and a light, crispy texture, they blended beautifully with the rich, creamy feel of the pudding. It was truly comforting and decadent at the same time. The worst part? My husband is not really a sweets person. Guess who had to eat the pudding? (me) So I warn you, make this when you have people to eat it. Save yourself from the temptation! 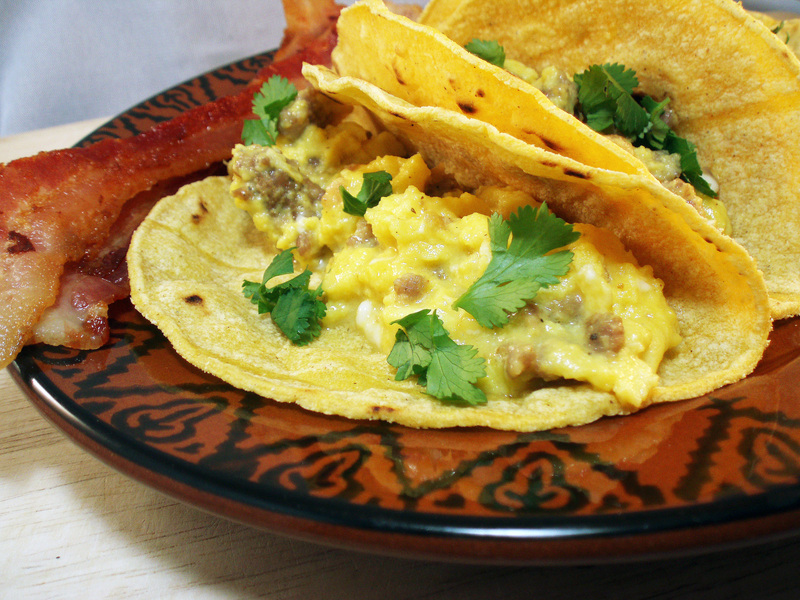 In a medium saucepan, add rice flour, agave nectar, and eggs, and whisk together. Pour in milk slowly, whisking, until milk is incorporated. Turn heat on medium-low and cook for 10 minutes or so, whisking, until mixture thickens and coats the back of a spoon. Add butter and vanilla extract and remove from heat. 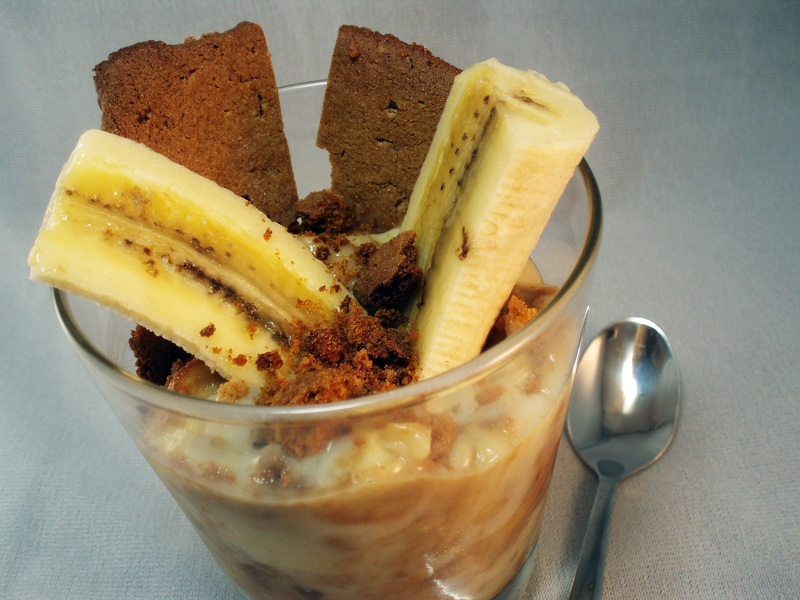 Layer an 8X8 inch glass dish (or similarly-sized dish) with graham crackers, and then a layer of bananas. Spoon some pudding over to cover. Add another layer of crackers and bananas and repeat. Top with a few remaining slices of banana and cover with plastic wrap. Refrigerate for 4-5 hours or up to overnight. When ready to serve, crumble graham crackers and top pudding with crumbs. I was so excited to find out that Lauren of Celiac Teen was hosting this month’s Daring Bakers Challenge. Lauren always amazes me with her skills in the kitchen – I was just barely understanding the concept of cooking at her age! And to have a Daring Bakers challenge that I didn’t have to convert to gluten-free? Well, that made things a million times easier! 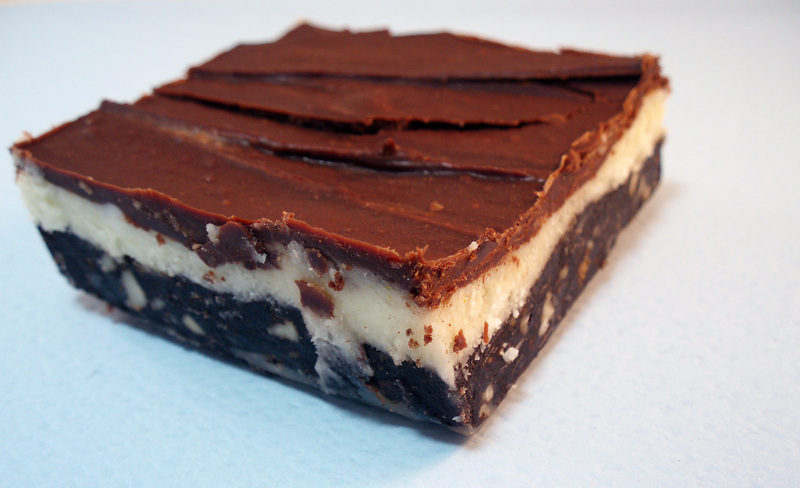 I’d never heard of Nanaimo Bars before this challenge. But now that I’m in the loop, I’m definitely making these again, with one requirement: that there other people are around to eat them all for me. These babies were SO good. But they were also SO bad, calling me from the fridge at all hours, begging me to have just one more. And I caved, too many times. With a graham cracker-almond-coconut-chocolate layer, a creamy vanilla layer, and another chocolate layer, who could resist? I followed Lauren’s recipe rather closely, only substituting 1% milk for whole milk in the graham crackers. (I just don’t usually stock whole milk.) Those crackers were better than any gluten-containing ones I’d ever had – I munched on a few, and even used some for banana pudding (recipe to come soon!). And for the purpose of making graham cracker crumbs for these bars, they were excellent. I think that in the future, I’d love to try to make these with a mint filling in the middle layer. But honestly, they were amazing just as is. In a bowl of a food processor, combine the flours, brown sugar, baking soda, and salt. Pulse a few times to combine. Add the butter and pulse on and off, until the mixture is the consistency of a coarse meal and you can no longer see chunks of butter. In a small bowl or measuring cup, whisk together the honey, milk, and vanilla. Add to the flour mixture until the dough barely comes together. It will be soft and sticky. Turn the dough onto a a surface well-dusted with rice flour. Pat the dough into a rectangle about 1 inch thick. (I did this on top of some plastic wrap) Wrap with plastic wrap and refrigerate until well-chilled, 2 hours or overnight. Divide the dough in half and return one half to the refrigerator. Sift an even layer of sweet rice flour onto a work surface and roll the doughinto a long rectangle, about 1/8 inch thick. The dough will be sticky, so flour is necessary. Cut into 4X4 inch squares. Repeat with remaining dough and chill until firm, about 30 minutes. Adjust the rachs in the oven to the upper and lower thirds and preheat to 350 degrees. Prick the wafers with a toothpick or fork, not all the way through, in two or more rows. (I forgot to do this, but they still came out fine.) Bake for 25 minutes, until browned and slightly firm to the touch, rotating sheets halfway through to ensure even baking. Cool completely. To make crumbs – place wafers in a food processor and pulse until crumbs, or place in a large ziploc bag, force all the air out and smash with a rolling pin. For the bottom layer: Melt unsalted butter, sugar, and cocoa in top of a double boiler. Add egg and stir to cook and thicken. Remove from heat. Stir in crumbs, nuts, and coconut. Press firmly into an ungreased 8X8 inch pan. For the middle layer: Cream butter, cream, custard powder, and powdered sugar together well. Beat until light in color. Spread over bottom layer. For the top layer: Melt chocolate and unsalted butter over low heat. Cool. (Cool to room temperature. If you don’t, your top layer will swirl in with the middle layer.) Spread over middle layer and chill.until firm. Cut into squares. Are you still following through on that New Year’s resolution? 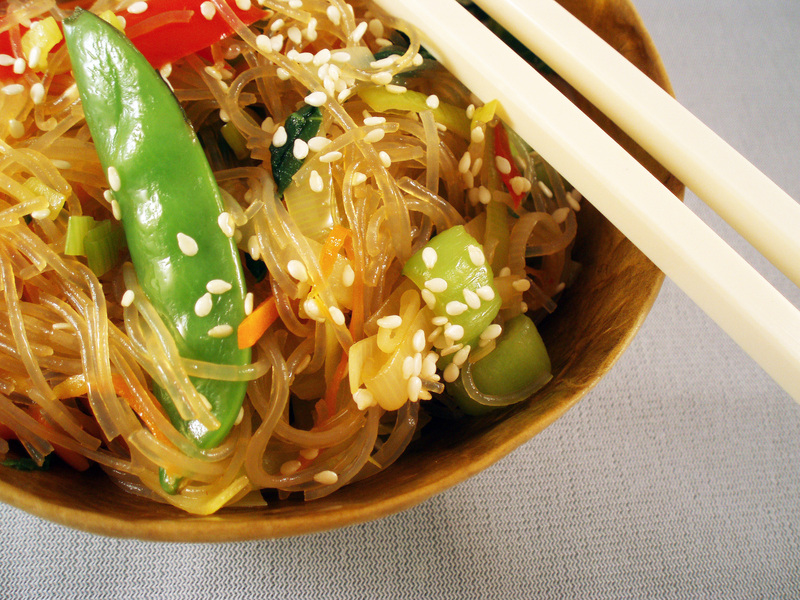 You know the one you made, promising yourself that you’ll eat healthier (More fiber? More veggies? Less meat?) in 2010? If it has been a bit of a struggle, or even if you’re still on board, but you’re sick and tired of the lettuce-based salads, smoothies, and the like, check out quinoa. Quinoa is a tiny seed that acts like a grain. But it’s more than just another grain. 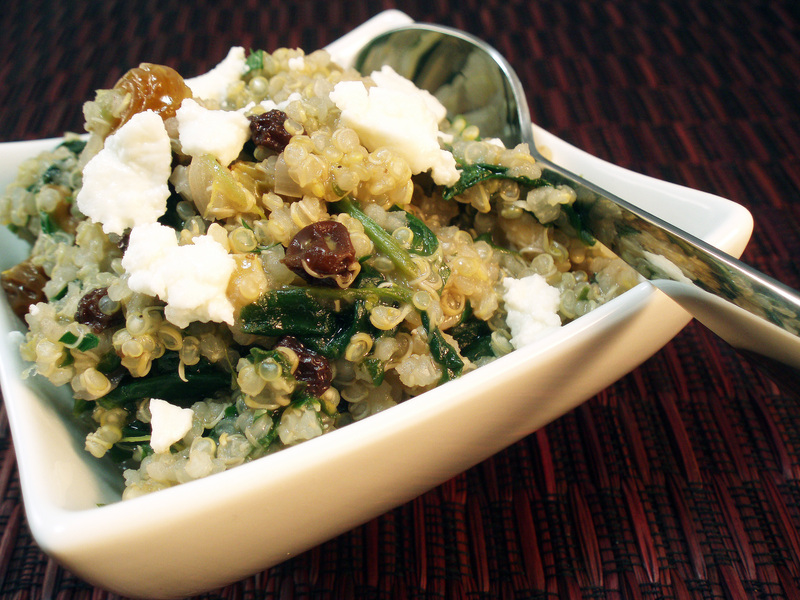 Quinoa is packed with healthy fiber, protein, and vitamins and minerals. 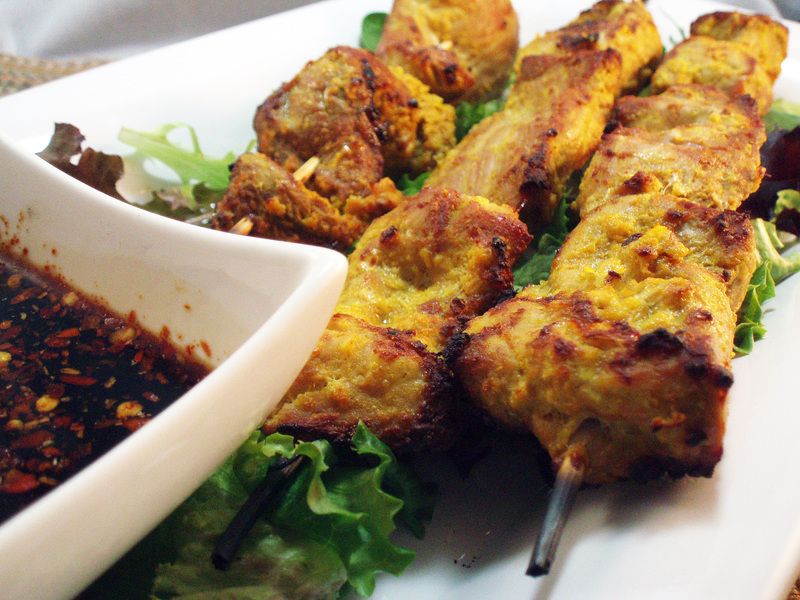 It’s nutty in flavor, and will fill you up, leaving you satisfied. It’s gluten-free, so for those of us that have to stay away from gluten, this seed makes a perfect stand-in for recipes that call for bulgur or couscous. I personally love it – it cooks up in 15 minutes, and absorbs flavors and dressings without getting mushy, making it perfect for a salad such as this. What’s wonderful about this salad? You can throw in pretty much anything you want. Really. I stood in my kitchen last night, deciding what easy-to-make, easy-on-the-tummy meal I wanted to throw together. This salad literally originated from leftovers and pantry staples. Substitutions are simple – I can imagine dried cranberries in place of the currants and raisins, almonds or pine nuts in place of the walnuts, or fresh spinach, kale, or chard in place of the frozen spinach used here. Really, it’s all about you, and choosing a mixture of ingredients that will satisfy, and keep you on that road to eating healthier. In a medium saucepan, heat the olive oil to medium heat. Add the onion and garlic and sauté for 2-3 minutes or until soft. Add the quinoa and continue to sauté for another minute or so. Add the raisins, currants and water and bring to a boil. 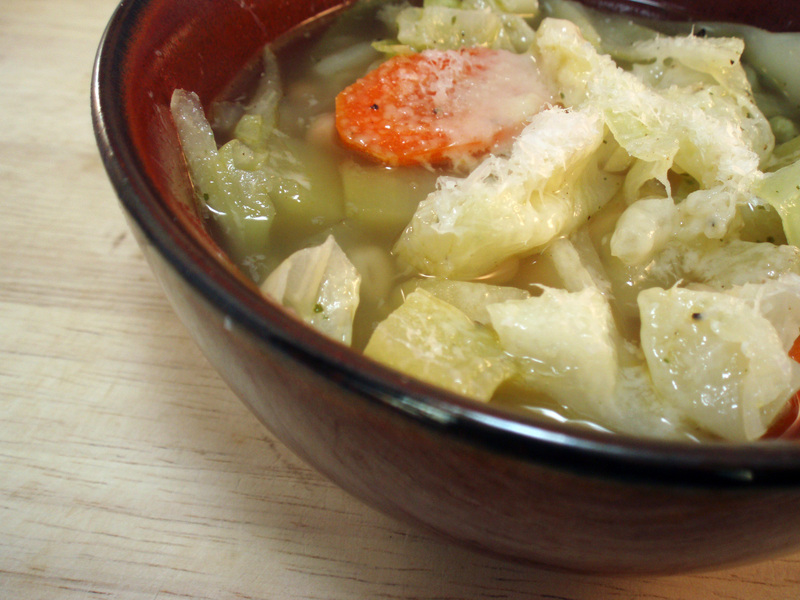 Reduce to a simmer, cover, and allow to cook until water is nearly absorbed, about 10 minutes. Stir in spinach and cover again and let cook another 5 minutes. Remove from heat and allow to cool for a few minutes. Stir in lemon zest, lemon juice, walnuts, and parsley. Season generously to taste. Drizzle olive oil over and stir in. Serve chilled or at room temperature, topped with a bit of feta.